For quantitative determination of glutathione reductase activity. GLUTATHIONE REDUCTASE (GR) reduces oxidized glutathione (GSSG) to the reduced sulfhydryl form GSH which is an important cellular antioxidant. A high GSH/GSSG ratio is important for protection against oxidative stress. 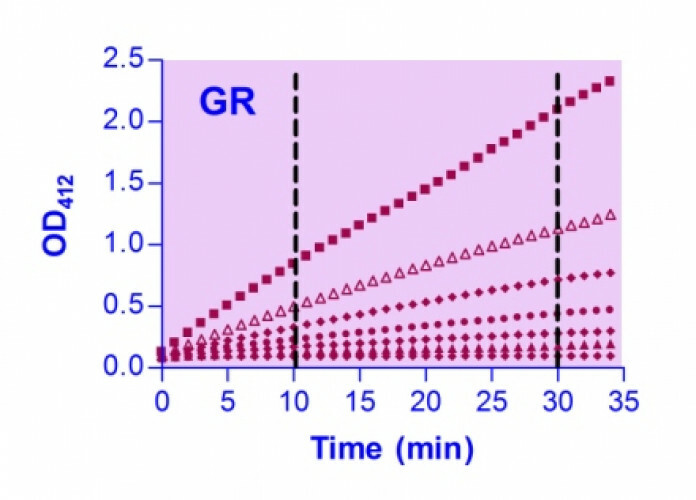 Thus, measurement of GR activity is used as indicator for oxidative stress. BioAssay Systems’ non-radioactive, colorimetric GR assay is designed to accurately measure GR activity in biological samples with a method that utilizes Ellman’s method in which DTNB reacts with the GSH generated from the reduction of GSSG by the GR in a sample to form a yellow product (TNB2-). The rate of change in the optical density, measured at 412 nm, is directly proportional to GR activity in the sample. Applications For quantitative determination of glutathione reductase activity. References Assay: Plasma in Horses (Pubmed).